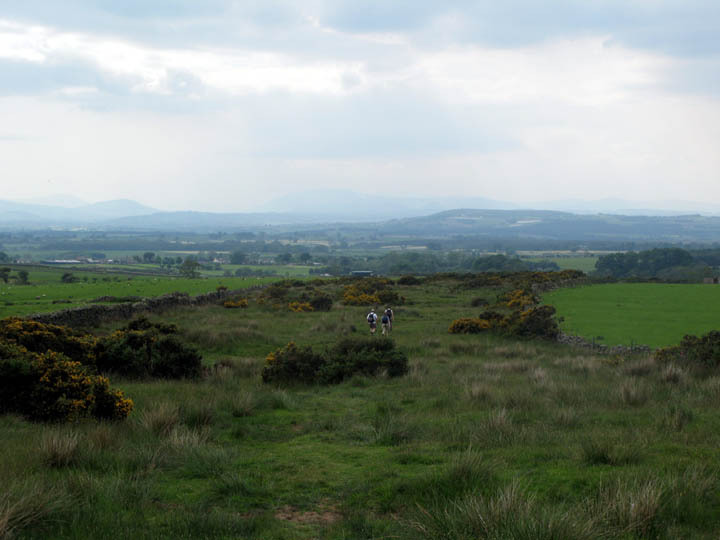 Location of Start : Kirkland, Cumbria, Uk, on the edge of the Pennines. 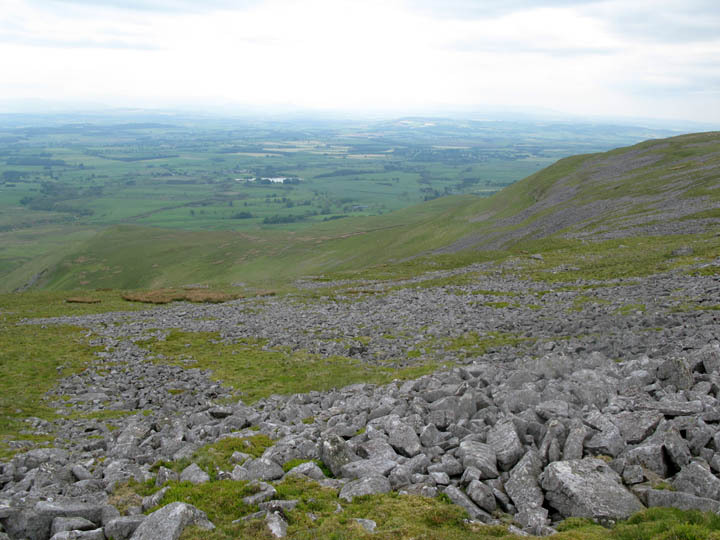 Places visited : Kirkland, Cross Fell, Wild Boar Scar, Grumply Hill and back. 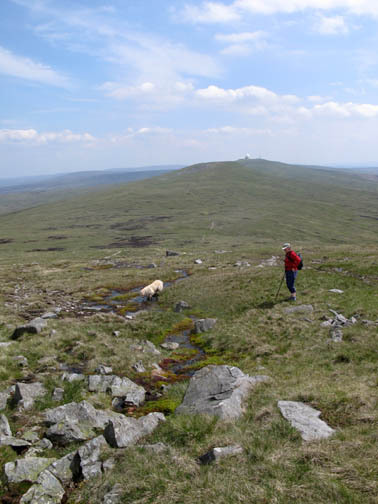 Walk details : 9 mls, 2350 ft of ascent , 5 hrs 30 mins. Weather : Sunny, hardly a breath of wind. Anne, Andrew and Ann at the gate beyond Kirkland Hall. 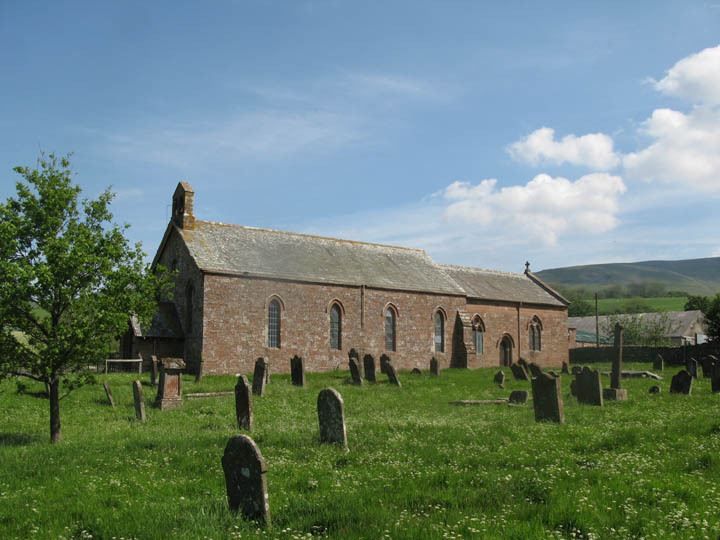 We were invited across to Anne and Andrew's for the weekend and this enables us to walk some of the more easterly areas of Cumbria. 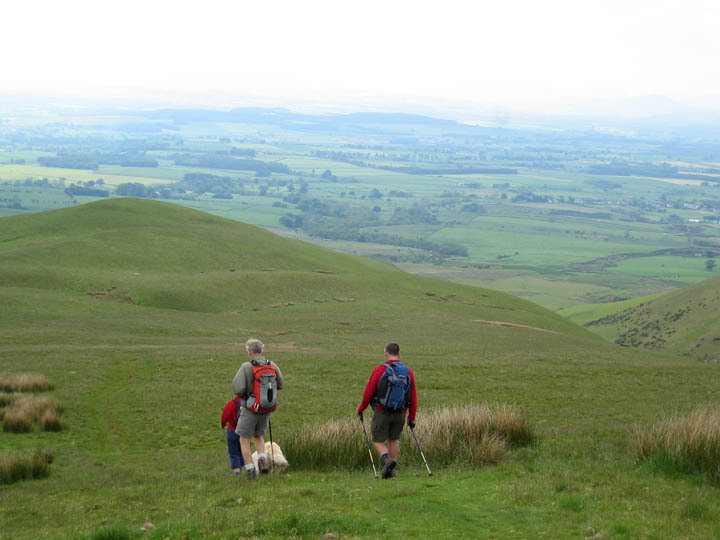 They live the other side of Penrith, near Appleby (where they have the Horse Fair) and so we decided to walk to the highest point of the Pennines. 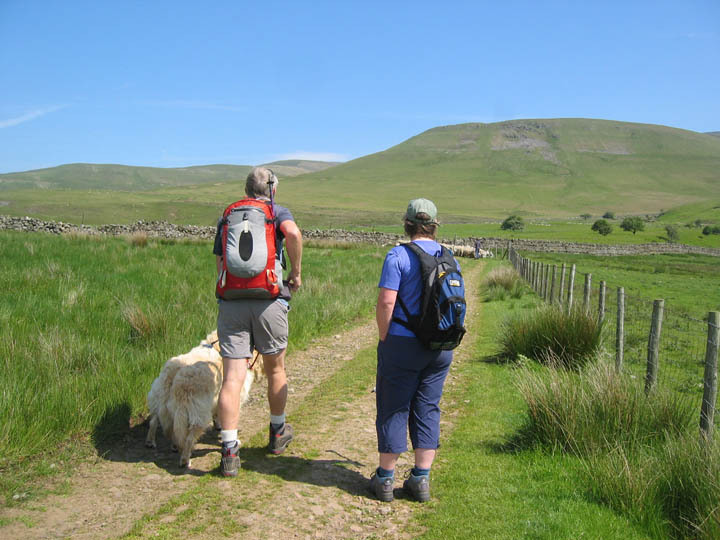 Cross Fell, at 2921 feet, competes well with the Lakeland giants and this walk would take us on a circular route across it's top. We started the walk from the parking area near the Church at Kirkland. 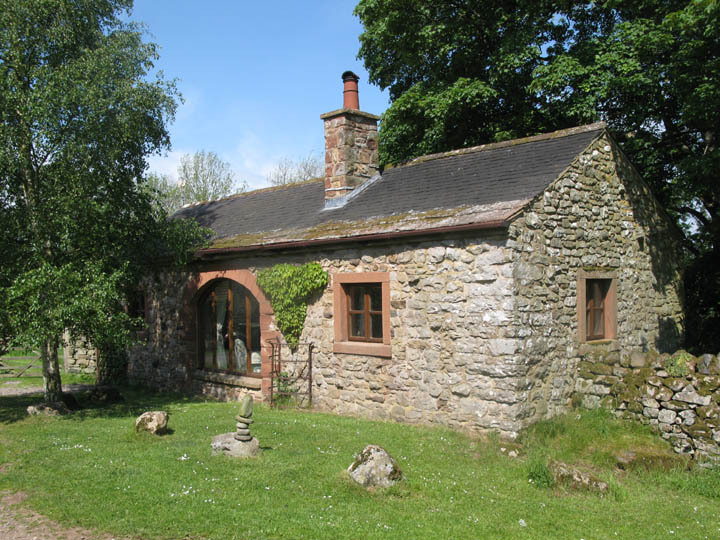 A delightful small cottage conversion on the left of the track as we make our way out towards the fell side. It's a warm day so it's cool clothing from the outset. 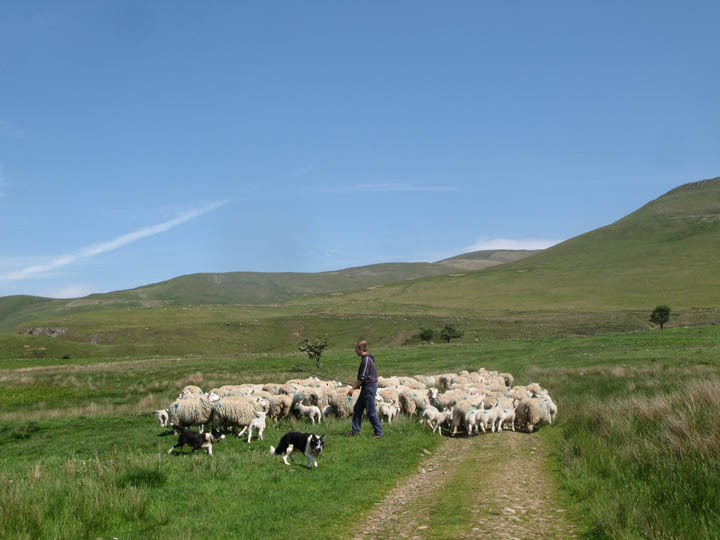 We hold back slightly as the farmer manoeuvres the sheep out through the gate. Click here or on the picture for sound and video. Sheep have only one speed so we were invited to pass. 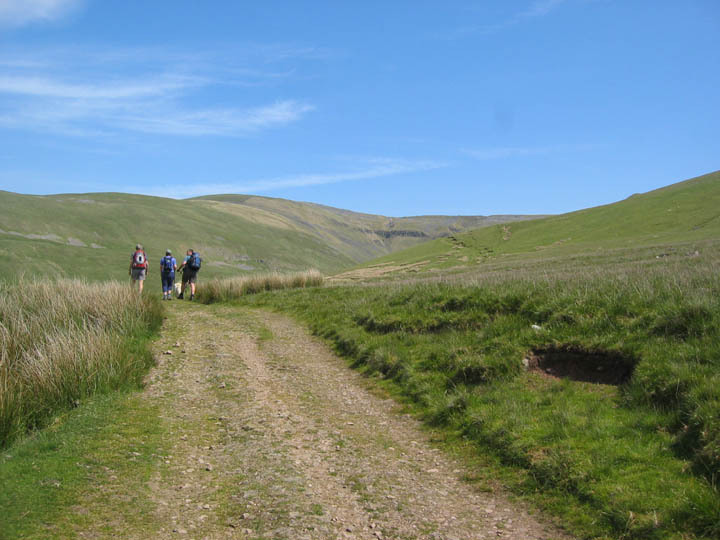 Taking the old miners track onto the fell, we climb steadily up in the late morning sunshine. 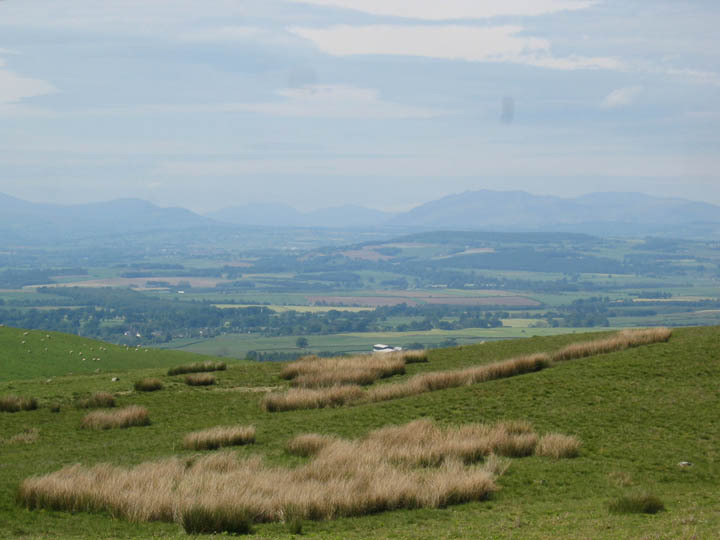 Here we look back across the Eden Valley to the distant fells of the Lake District some twenty miles away. 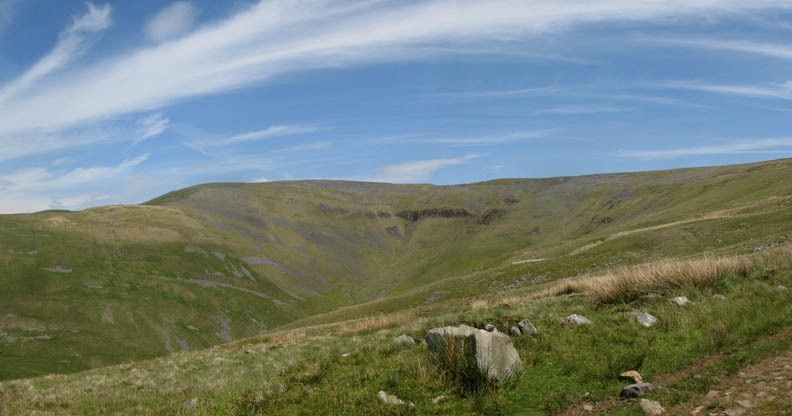 Clough Head and the Dodds to the left, Grisedale in the centre and Blencathra then Skiddaw to the right. 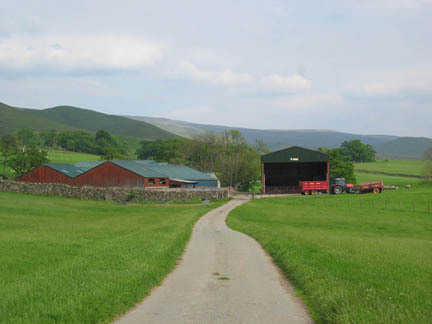 Ahead is Brown Hill. Our route skirts round the side of High Cap as we climb. 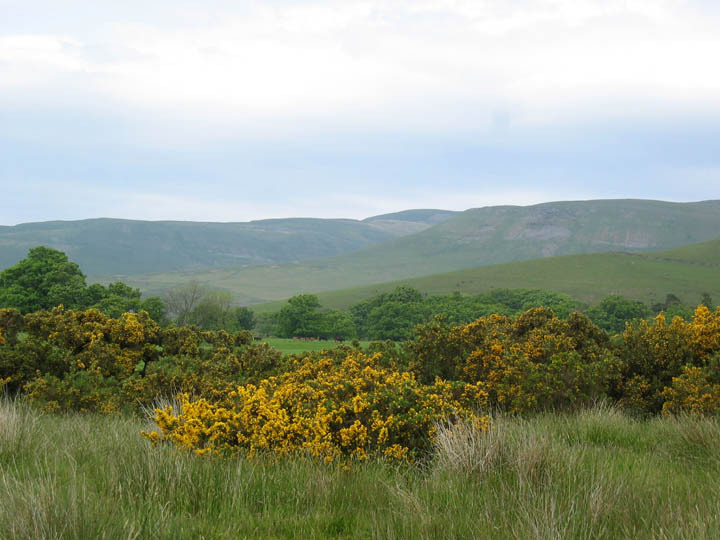 The darker rock section on the side of Brown Hill is part of the Whin Sill. This is a a geological formation of hard rock that runs from here to the east coast. 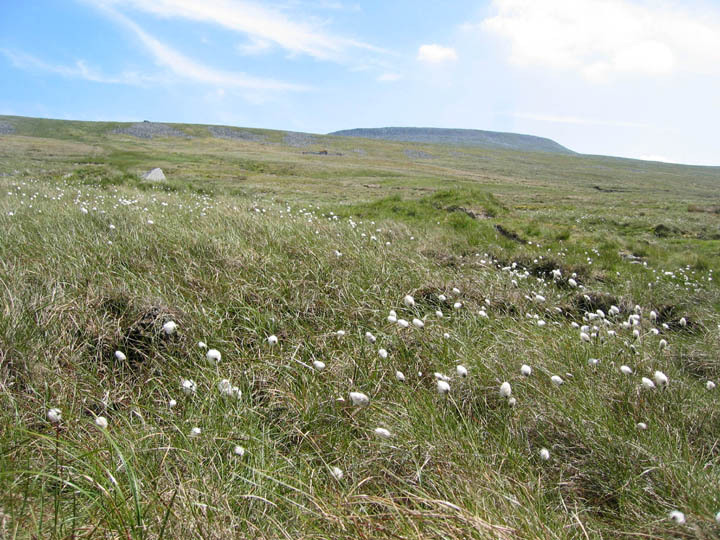 Cotton Grass as the summit of Cross Fell appears for the first time since we started climbing. 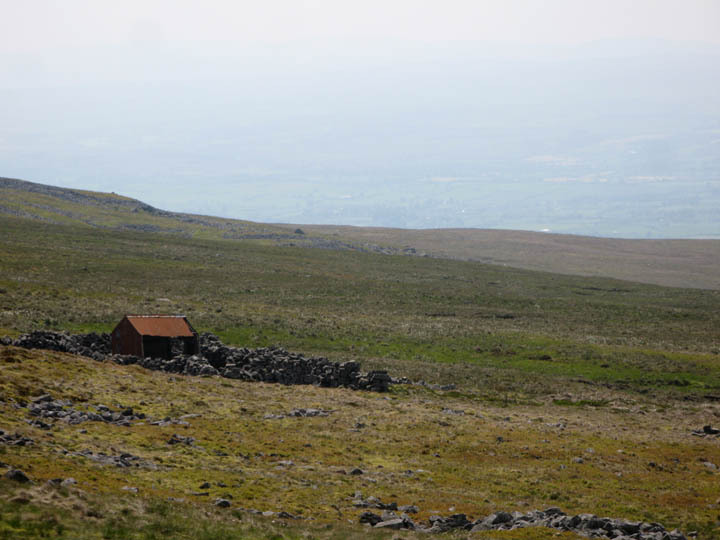 The map shows an old Bothy, but I'm afraid this old miner's hut has seen better days. Anne and Andrew reach the highest part of the main path . . .
. . . and it's time to turn to start the final climb to the summit. 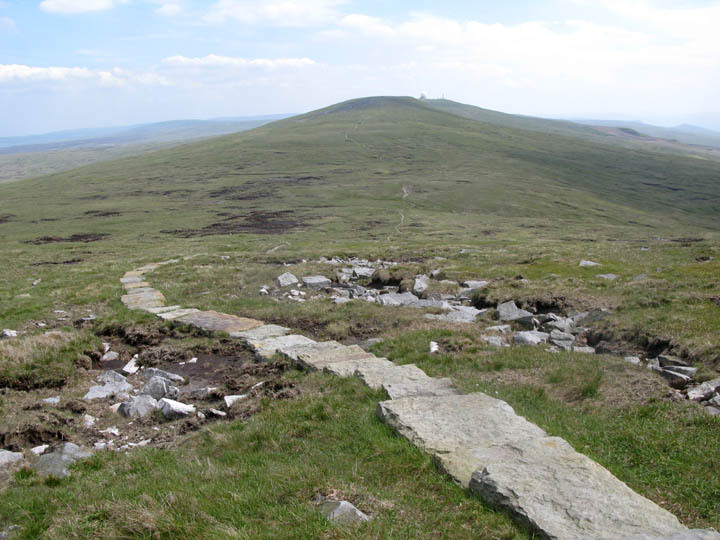 The Cairn marks the path junction where our cross-Pennine route is joined by the Pennine Way long distance path. We took a rather boggy short cut over to the summit path instead of walking the last 100 yds to join the drier route up from this cairn. Not a good plan ! 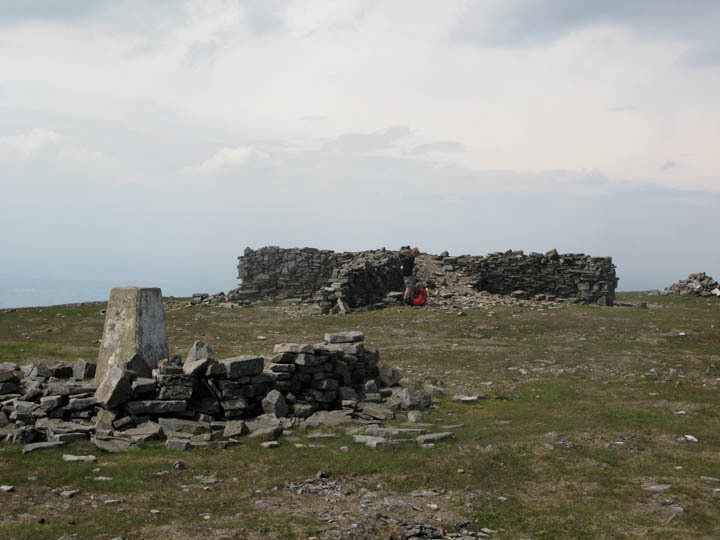 One false summit cairn and then we were up onto the broad top of Cross Fell. 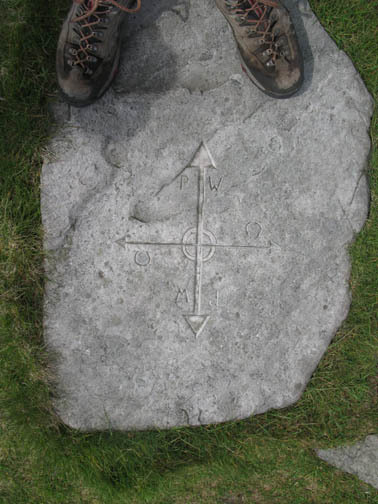 In no time at all we were standing at the Ordnance Survey trig point. Our lunch spot was at the summit shelter. 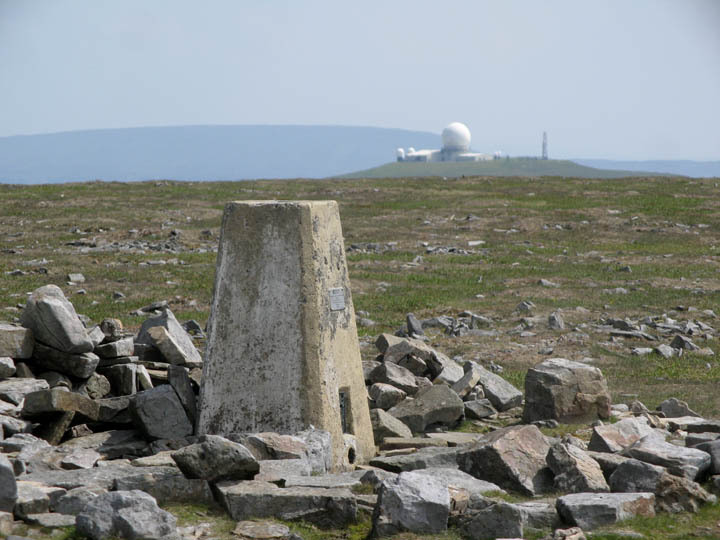 The view from the trig point is dominated by the Radar installation on the adjacent Great Dun Fell. A telephoto shot alters the perspective, bringing the "golf ball" seemingly closer. 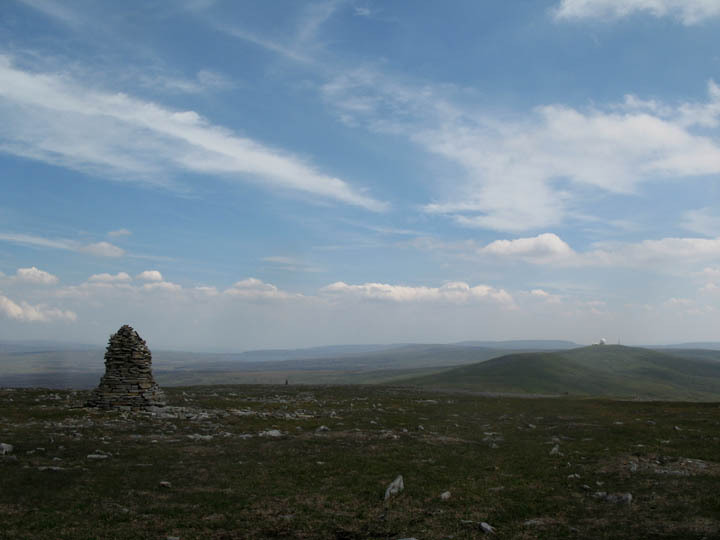 Heading south east across the top of Cross Fell, we are guided by these two fine cairns marking the route of the Pennine Way. 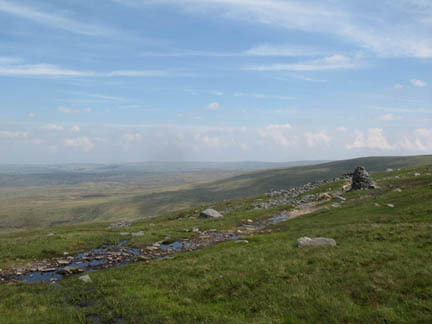 Behind, in the distant haze, is Cow Green Reservoir, part of the River Tees water supply. I sat to get a different photo perspective on the second cairn, only to be greeted by Harry, which made photography a little more difficult ! As you may gather, Ann has brought the second camera along today. A number of these photos are taken by her. This area of peat bog ahead of us is known as Tees Head, the official start of the infant River Tees. 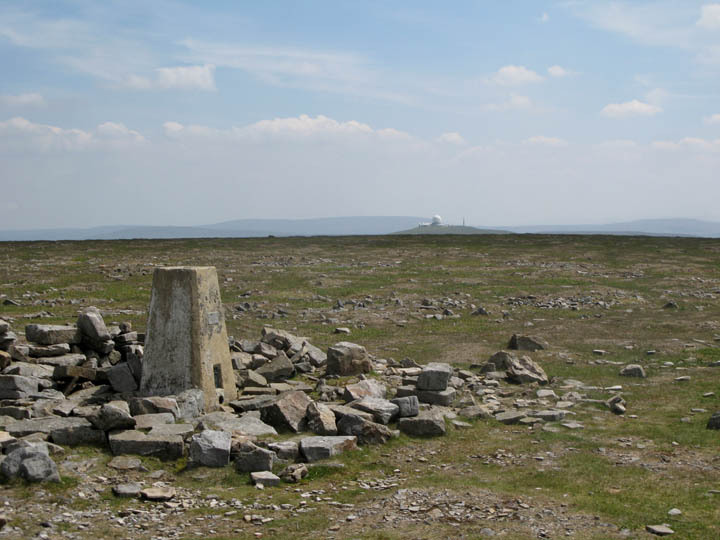 Beyond is Little Dun Fell and Great Dun Fell with the Radar Station. 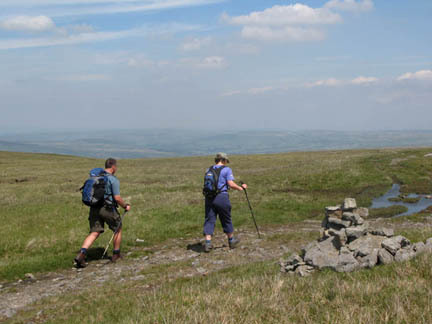 A mountain spring - the source of the river itself ? 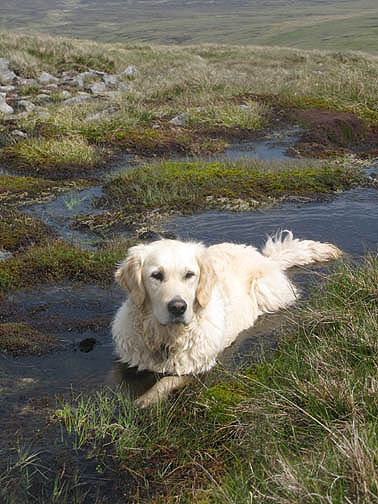 It certainly makes a fine place for Harry to cool down ! Paving stones make up the pathway through this peaty section of the route. One of the stones is a little different. 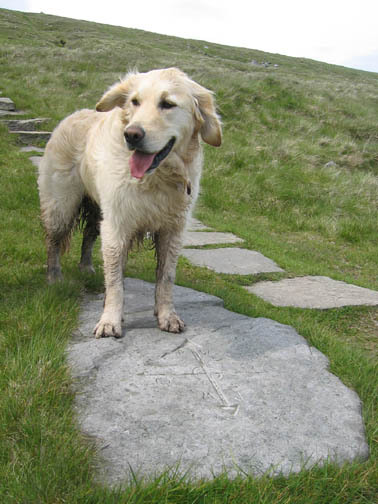 No ancient engravings but a signpost representing the Pennine Way (PW) and the smaller bridle way (horseshoe). From here it was down hill all the way. The last of the summit screes crossing our route meant the minor path was difficult to find at times. We were actually making for that patch of more yellow grass on the lower slope ahead. 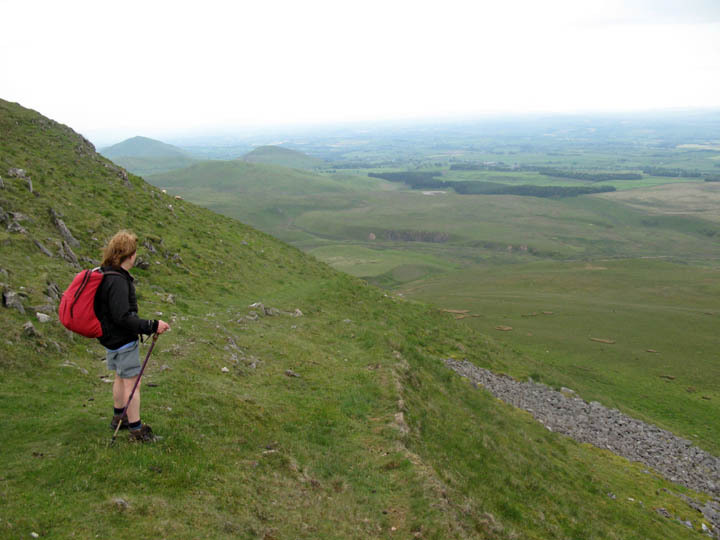 The sudden change of angle and the diagonal route down signified we had reached Wild Boar Scar. 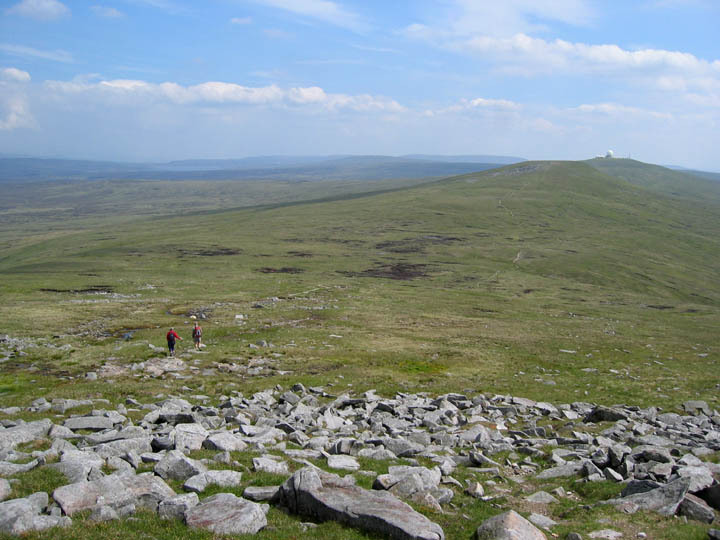 Burney Hill, Knock Pike and Dufton Pike are the three minor grassy peaks in the distance. and it was just a minor diversion from the path that swung right here and continued on down the valley. 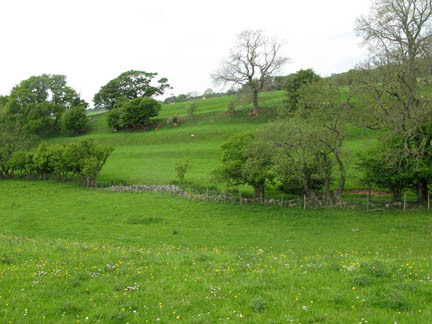 Back onto farmland proper as we make our way across rough pasture between the two improved fields. Looking back at High Cap and Brown Hill. Our outward route climbed up and around into the second valley under the distant Brown Hill. "The Hanging Walls of Mark Anthony"
Ranbeck Farm, presumably home to MA in an prehistoric times. One final feature on the map as we travelled back to Kirkland was a series of "Cultivation Terraces" known as the "Hanging Walls of Mark Anthony". They must have looked like paddy field terraces at one time, but now they have blended in and hardly show. Blink as you pass and you'll miss them. Maybe they were something to do with an old dwelling related to the old Roman Road that passes within a mile of the site. Technical note: Pictures taken with a Canon G7 and Ixus Digital cameras. This site best viewed with . . . the next map sideways from the ones I've got.